If you care about the good looks of your garden, you probably know that a lawn mower is not enough if you desire a perfectly manicured lawn. One of the essential tools needed for the lawn care is a weed eater. This tool will not only allow you to trim the grass but most of the models available on the market transform into an edger and let you perfectly cut the grass nearby fences or driveways. Among all the tools available out there, the Worx electric weed eaters stand out from the crowd. They are reliable, lightweight and easy to maneuver, so there is no wonder why they are the choice of many homeowners and lawn care professionals. To help you choose the right weed eater, I put up this list of best Worx electric weed eater reviews. 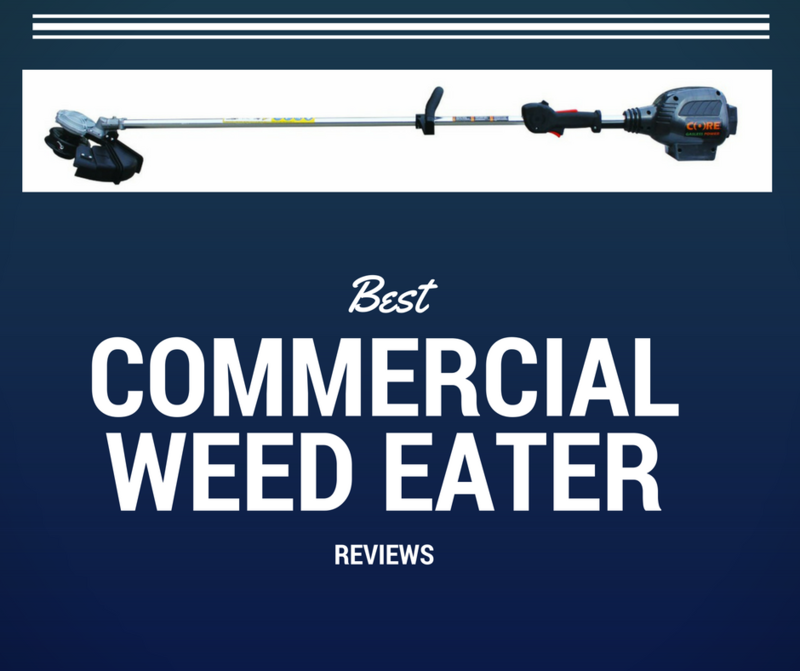 But first, let’s find out how to choose the right electric weed eater. Electric weed eaters, also named electric string trimmers or whackers, are popular garden care tools used to maintain the lawn weed-free and to manicure the aspect of the grass. There are two main categories of weed eaters: gas-powered and electric. Today, I’m going to talk about the electric wee﻿d eaters, which are typically manufactured for the residential use. The electric weed eaters are divided into two categories: corded and cordless. Both present advantages and disadvantages, and generally the choice is based on your personal preferences. Regardless of the model you want to buy, there are a few things to consider before making a purchase. First of all, you should consider your necessities. Depending on the type of grass and weeds present on your lawn you should decide the dimension of the cutting swath and the desired power. As a general rule, the corded weed eaters are typically more powerful compared to their cordless counterparts. However, the corded tools will limit you a lot because you will be dependent on the length of the power cord. A solution to this problem might be the purchase of an extension cord of the desired length. Another thing you should pay attention to when trimming the grass with a corded weed eater is to not accidentally cut the cord since there is the risk of getting electrocuted. If you have a lawn with thinner grass and weeds, I recommend you to use a cordless weed eater. These models are equipped with batteries of various voltages, so the power is very different from model to model. The best part of the cordless weed eaters is that you will be able to move freely on your lawn. The limit, in this case, is put by the autonomy of the battery. The autonomy can vary a lot between the different types of batteries, from about half an hour to one hour or even more. However, you will be able to buy an additional battery if you need to use the weed eater for a longer time. Shoulder strap: a great feature that will allow you to carry and handle the tool with more ease. Anti-vibration system: provide an increased comfort during usage. Ergonomic handle: ensure a better grip and increases the maneuverability. Telescopic shaft: another feature thought for your comfort, allowing you to adjust the shaft’s length. Variable speed: an important feature especially for the cordless ﻿weed eaters. Multi-use tools: some manufacturers produce weed eaters that can be transformed into other tools such as edger, pruner, cultivator, blower, and so on. Since it might be difficult to find a weed eater that has all the features listed above, you should decide what features are most important to you and to choose a model accordingly. Even if the weed eaters are easy to use tools, there are a few safety tips you should follow to keep you and your family safe at all times. The first thing to do, before starting trimming, is to make sure that you are wearing appropriate footwear and work gloves. The chances of getting electrocuted while using an electric weed eater are minimum but you can never be too careful. If you’re using a corded model, pay attention to not accidentally cut the power cord. You should also wear a pair of safety goggles to avoid any debris from getting into your eyes.Replace the trimmer’s line with a new one when necessary and make sure to use the type of line specified in the operator’s manual. After trimming, remember to clean all the dirt and residues from the weed eater’s head to maintain it in good conditions. Worx is the Positec Tool Corporation’s brand for the gardening tools such as lawn mowers, chainsaws, and weed eaters. With its most famous product being the popular GT string trimmer, there is no doubt that this manufacturer is specialized in the production of high-quality weed eaters. Worx weed eaters are typically cordless, lightweight and easily maneuverable, while the quality lines make them a top choice for many homeowners. Have a look at the best Worx weed eater reviews and decide which is the right tool for you. If you have a small lawn, then you will probably love this fabulous tool from Worx. In fact, the GT 2.0 WG160 is not only an excellent cordless weed eater and edger, but it is a mini mower too, so you will be able to buy all the tools you need for the lawn care in a single, convenient solution. Lightweight and easily maneuverable, this weed eater is capable of trimming the grass from any angle and it is fully adjustable to fit the needs of all homeowners. Powered by a 20-volt lithium battery and using a single cutting line, this tool will transform into a faithful companion to use for all the garden chores. Adjustable telescopic shaft: you will be able to adjust the weed eater’s shaft at seven different heights. 3-in-1 function: equipped with a dual position for the wheels, this tool can be transformed from a weed eater into an edger or mini mower in seconds. 12-inch cutting swath: perfect for small and medium size gardens. Adjustable spacer guard: to keep all your flowers or garden furniture safe, this weed eater features a fully adjustable spacer guard. The battery has a rather long recharging time, of about three hours. However, if you need more power, you can just purchase a second battery. If you already have your trusted lawn mower and are searching for a weed eater/edger alone, then you should try this GT WG151 cordless electric weed eater. Powered by an 18-volt lithium-ion battery, this weed eater has about half an hour of autonomy. This should be sufficient for a small lawn. The battery boasts a fast recharge and it can also be used with other Worx tools from the Lithium Power Share series. Easy to use, this weed eater can be converted into an edger in a matter of seconds, while the adjustable spacer guard will keep your plants and objects safe. Another great feature is the 90-degree tilting shaft designed for an easier use on slopes or in difficultly reachable areas. Adjustable rotating handle: this weed eater was designed to be comfortable to use, featuring a height-adjustable handle that rotates for an easier transformation from a weed eater to an edger. Automatic line feed: to ensure an optimal cutting performance, Worx equipped this tool with an automatic single line feed. Lightweight: weighing only 5.3 pounds, this weed eater is easily maneuverable and easy to carry. Quick-charging battery: a completely drained battery will recharge in about half an hour. Some users complained about the short life of the battery. A more powerful alternative if you want a weed eater and edger alone, is the WG155. This tool is powered by a 20-volt lithium battery and has a 10-inch cutting swath, being perfect for small and medium size lawns. Similar to the other two Worx weed eaters reviewed above, this unit is lightweight and easily maneuverable. The WG155 also features an adjustable telescopic shaft and a fully adjustable trimming head, being a versatile and easy-to-use tool. Lightweight: designed to minimize the operator’s fatigue, the WG155 weighs only 5.3 pounds. Twin wheels: to improve the maneuverability when used as an edger, the WG155 features a set of two in-line wheels. Three line spools: you will not have to worry about replacing the line for a while because this tool comes with three single-line spools. Two-year warranty: this cordless electric weed eater comes with a convenient two-year warranty. Even if the handle is adjustable in height, it just seems to be rather short for some people. Boasting a large 15-inch cutting swath, the WG119 is one of the largest weed eaters in its class, being ideal for medium size and large lawns. Powered by a 5.5 Amps power cord and boasting a four-position pivoting head, this weed eater was designed for the convenient use on any type of terrain. This weed eater uses a dual-line spool that increases the cut efficiency, while the tool can be transformed into an edger with a simple touch. Adjustable spacer guard: like almost all the Worx tools, the WG119 is also equipped with a convenient adjustable spacer guard that will keep your flowers and garden objects safe. 90 degrees tilt head: with this weed eater you will be able to reach all the corners of your lawn, thanks to this convenient feature. Corded: you will not have to worry about running out of power while working because this trimmer is corded. Powerful: the WG119 is more powerful compared to its cordless counterparts. Therefore, the cutting quality is higher. If you have a large lawn, you will probably have to invest in a power cord extension. A versatile weed eater and blower combo is the WG918, a package of two useful tools that are powered by 20-volt MAX batteries. The best part of this combo package is that it includes two batteries, so you will not have to worry about running out of power anymore. The WG918 is composed of a convenient WG155 cordless string trimmer (already reviewed above) and a WG545 blower that will help you keep your driveways and paths leaf-free during the autumn months. Two garden tools: you will get two useful gardening tools, a two-in-one trimmer and edger and a leaf blower. Two batteries: both tools use 20-volt MAX batteries that are interchangeable. Powerful blower: you will be able to easily remove any debris from your yard thanks to the 120 mph air speed of the blower. Auto line feed: the weed eater uses an auto-feed single line spool that ensures an efficient cut. In the package is included only one charger. This shouldn’t be a problem in most of the cases, but you will not be able to recharge both batteries at the same time if you want to. These best Worx electric weed eater reviews should help you choose the best gardening tool. As you can see, Worx manufactures many versatile tools and has some convenient purchase packages that can meet the needs of all homeowners. However, my favorite Worx weed eater is the WORX GT 2.0 WG160 Cordless Lithium Grass Trimmer/Edger & Mini Mower. The best part about this tool is its versatility. Even if I usually use a regular mower, it’s nice to know that I have this mini mower available for the tighter spaces of my yard. The tool is lightweight and easy to use, completely adjustable and designed to be used on all kinds of terrains. All these great characteristics, together with the others described above, make the GT 2.0 WG160 the best Worx weed eater available on the market.